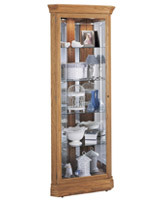 A No-Reach™ light located on the china cabinet back to provide easy access to lighting. 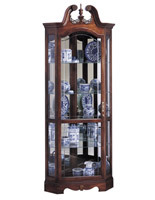 A glass, mirrored back to enhance your china's appearance. 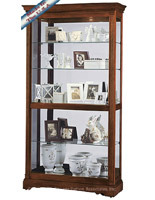 A beveled glass, picture-frame front for elegance and an unobstructed view of your china collectibles. 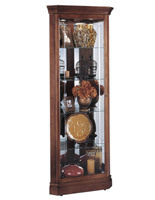 Interior lighting for a brighter, more natural way to showcase your china and other items. 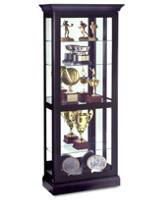 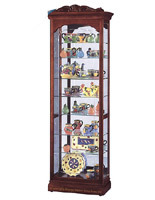 This display cabinet will fit perfectly into the corner of these living room, dining room, or parlor. 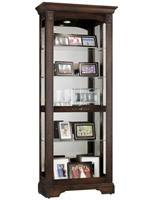 The corner china cabinet is finished with a rich, black satin stain to give it an elegant look. 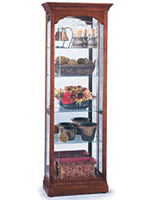 28.0" x 80.0" x 16.0"